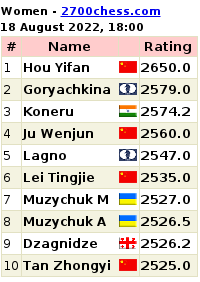 As expected White opens 1. d4 Nf6 2. c4 d6 3. Nc3 Nbd7 4. e4 e5 5. Nf3 Be7 yes, you're right, its almost a Philidor, but there's a pawn on c4, so that makes it a Queen Pawn game, I suppose. 6. Bd3 This didn't seem quite correct to me, and the statistics back me up. In 2710 games its been played 41 times. 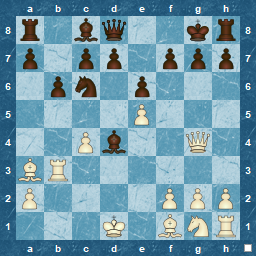 The most obvious move is Be2, as that doesn't block the d-file and still prepares castling. Its not the reason for white losing, but surprisingly the statistics also say that Be2 scores 60% against only 48% for Bd3. Lucky we don't play by statistics ! This can't be right. Not only do knights not generally belong on g3, but as discussed before Nxe7 is by far the better move. I was also expecting either f4, or better Bf4, developing and attacking. 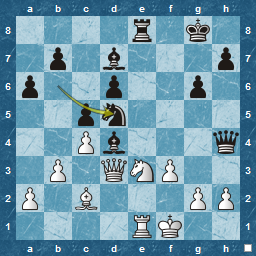 Strangely, I have had a few games with the Philidor where White places the Knight on g3, to no particular purpose. 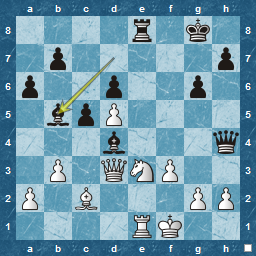 10...Bg4 11. f3 Be6 This seemed a decent position. 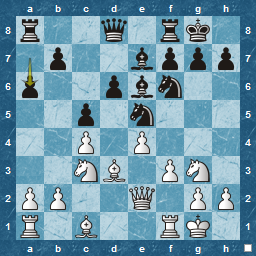 Bg4 prompts f3, which closes the Queen in, and e6 is where I wanted the bishop anyway. This isn't the best move (I'm talking about a6, but I don't think Qe2 is startling either ). This was a point where I should have thought further, and created a proper plan, rather than just denying b5 to white's knight. Quite amazing. 5 of black's 7 pieces are in 6 central squares. Is this good or bad ? Centralised and ready ? or just blocking each other ? 16. Bc2 Not sure why, possibly freeing the d-file for the rook, and preparing Qd3...b3 needs to be played at some point, and maybe Nxb6 was a good move here 16...Nfxd5 17. exd5 Bd7 I should have exchanged one, or two moves before, but was not sure if it should be bishop or knight, or what to do with the bishop after exd6. Bd7 is obvious, but I wasn't sure if is was good or bad. Exchanging is a key part of a plan, and, like comedy is best timed properly. 18. 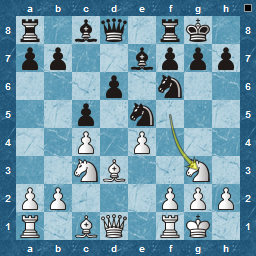 Qd3 Obvious and aiming for h7, mate, but what else could be played ? 18...g6 19. Bh6 I think this is not correct. Yet again, b3 is needed to safeguard the b- and c-pawns and prevent Na4. I actually wanted to play Bf5 to attack the Queen, but Nxf5 completely stops that ( and probably the game ! ). 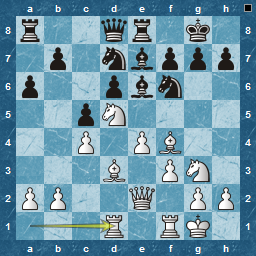 Second was, Bf6, aiming at the b2 pawn as b3 still hadn't been played. This was my prime aim, but I also realised that I had the threat of Bd4+, and a check is always useful. At this time I felt that Black was under a small amount of pressure, but was probbaly OK. Both sides have chances...and f5 opens the position after the exchanges. Despite the time on the clock [ white had 11 to my 6 minutes], this was an instant reply and not a good one. Kh1 is by far the best. After double-checking, the strong bishop pin on the king means that Rxe3 is the correct move 22...Bxe3 Rxe3 Rxe3 leaves a more or less equal position. 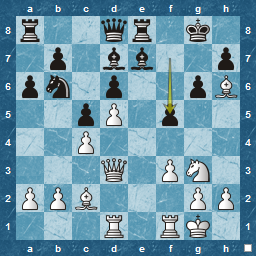 25...Qg5 or Qe7 has the same effect, opening e8 for the rook 26. Re1 Re8 27. Kf2 Qh4+ 28. Kf1 Nxd5! 29. cxd5 White took practically all his remaining time ( 7 minutes ) on this one. If 29.Nxd5, then Qxe1#. Another point of Nxd5. A queen pin versus the King, a bit like a Royal Flush at poker....the last time this happened to me in a standard game was an opponent mistake rather than a plan. Now it is all over, even with only 4 minutes left on the clock ! 30. Qxb5 axb5 31. g3 Qh3+ and White resigns.....I could have taken more material with Qxh2 as well, but the point was to get behind the pawns. Again, an enjoyable game regardless of the win. Prior to 22. Be3 I felt that I was doing OK, and keeping up with White. 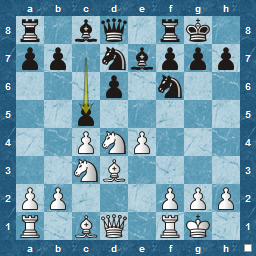 We both made mistakes, but didn't take advantage (especially white with 10.Ng3 ). This and the last game show me that eliminating basic errors ( or even major blunders ) gives a much better game. 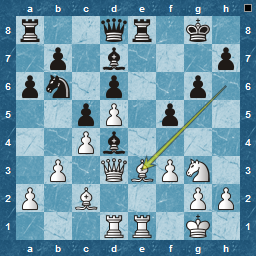 The decision to capture with Rxe3 and not Bxe3, as well as the Nxd5 tactics are quite simple, when time is taken to check them, so I think the time spent on tactics and reduction of blitz may have contributed subconsciously. I will probably return to this post after looking at the positions following 12. Qe2 and 15.Rd1.